A bold annual report; clear, compact and concise. Paying attention to the special people that work there. www.flowtraders.com. Flow Traders is a liquidity provider and market maker for ETFs. These are exchange traded funds; clusters of shares connected to a certain index. Becoming a publicly traded company will change your company’s status. This also means a different approach to the annual report. 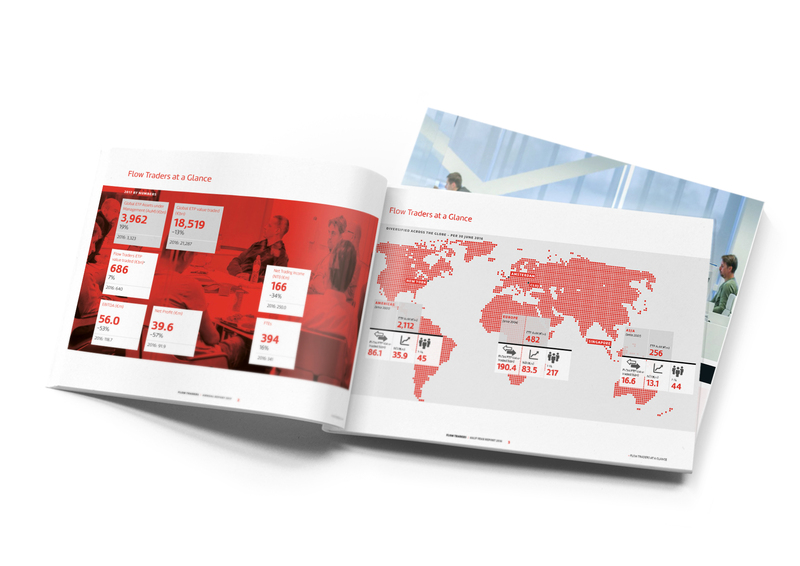 Flow Traders wanted a dynamically designed Annual Report that reflects the spirit of the company. And they sought guidance during the process. Flow Traders is a distinctive firm and so are the people who work there. This is reflected in the design: it exudes dynamism, teamwork and drive. Weekly status meetings between project managers at Flow Traders and Domani, often through conference calls, ensured great connectivity between all the moving parts.